This project will demonstrate Australia’s first solar thermal beam down system, concentrating solar energy from a heliostat field in order to heat a fluidised bed on the ground to 1300 °C. Water added to this bed will be split into hydrogen and oxygen using a two-step chemical process. Additional research will examine the conversion of the produced hydrogen into methanol that can be used as a hydrogen carrier to export markets such as Japan, an existing customer of Australian energy. 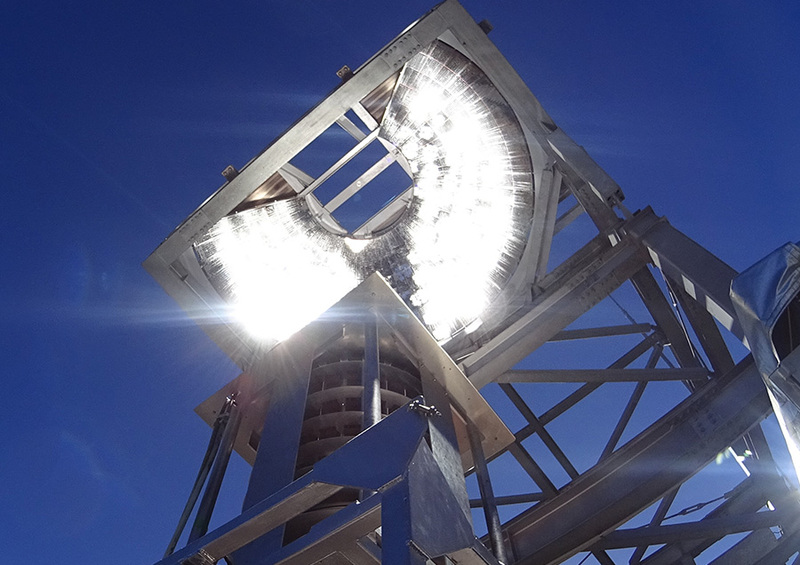 The project builds on over 20 years of work at the CSIRO in large scale solar thermal concentration technology, and for first time a secondary concentrator will be implemented to reflect and focus the solar rays to a fluidised bed on the ground. The fluidised bed for the project is being developed with Niigata University from Japan, a leader in water splitting catalysts. Quantifying the feasibility of a supply chain for the solar hydrogen to be exported will be undertaken by the Institute of Applied Energy. The project innovations will include a beam down system to be design and built at the CSIRO Energy Centre in Newcastle NSW. This system will concentrate solar energy enabling temperatures of 1300 °C to be reached and the facility will be available after the project to research new mineral and waste management processes that require high temperatures. The fluidised bed reactor will also be the largest of its kind in the world with the project taking the technology from the laboratory to demonstration. Thermally splitting water to produce hydrogen using Australian solar energy is a fully renewable method for producing a fuel for use in power generation, transport or production of chemicals. The project will utilise a newly developed catalyst to perform the splitting reaction in two steps, enabling hydrogen and oxygen to be produced separately. Once the solar hydrogen is produced it can be converted to methanol, an established fuel and chemical commodity that can take advantage of existing infrastructure to supply the world with Australian solar energy.